BrokenTooth is the Buttress/Wall that bisects the "canyon" JUST north of Catwall. Climbs here are splitter and sustained, ranging from 5.10-5.12+. One of the more notable features of the wall is a HUGE leaning block on the westernmost point of the wall. This also includes a natural cave/hall for those seeking shelter from the rain. The more popular cracks are thin, so bring lots of .25-2" cams. Drive a little over 8 miles past Newspaper Rock on UT 211. Pass the intersection of 211 ands UT 104 by approximately 1.5 miles. Look carefully for a wire gate on the East side of the road that is fastened by a pair of hooks on a chain (typically easier to look for dirt on 211 from the camp-road). 2WD vehicles with clearance should be adequate, but don't forget to SHUT THE GATE!!! Drive less than a mile. Park in the large dirt area adjacent to some VERY large rocks. The largest makes a good stargazing/cooking/sleeping spot incidentally. Take the obvious dirt trail on the East side of the dirt area. This takes you directly to the base of BrokenTooth Wall and immediately next to the Rain-Cave. It was cold at night, but great in the day! "We just issued a news release and map of the active rapture nesting areas in the Indian Creek Corridor. Here is the web address to the News Release (blm.gov/press-release/annou…). The ?map? is attached to the news release the link is on the right hand side. Background Information: compliance not to climb in these areas is voluntary and and strongly encouraged, as human disturbance can affect nesting success, however the routes are not legally closed. This requires additional environmental reviews and public notification through the Federal Register, which takes some time. Because of this, we are referring to these routes as "climbing avoidance areas" rather than closures. The entire climbing community is generally very supportive and helpful in these raptor protection efforts, and we hope these voluntary efforts will help keep these locations open outside of the nesting season for your enjoyment. Please be aware of climbing routes that have nesting raptors. This News Release requests climbers' cooperation in protecting eagles, peregrine falcons, and other migratory birds who use the Indian Creek area to raise their young. Between March 1st and August 31st each year, the BLM asks climbers to avoid climbing these walls until they have been cleared by agency biologists: The Wall, Far Side, Second Meat Wall, Disappointment Cliff, Fin Wall, Broken Tooth, Cat Wall, Slug Wall, and Reservoir Wall. Two of these walls are on partially or wholly on lands managed by SITLA, who is working cooperatively with BLM to protect raptors. 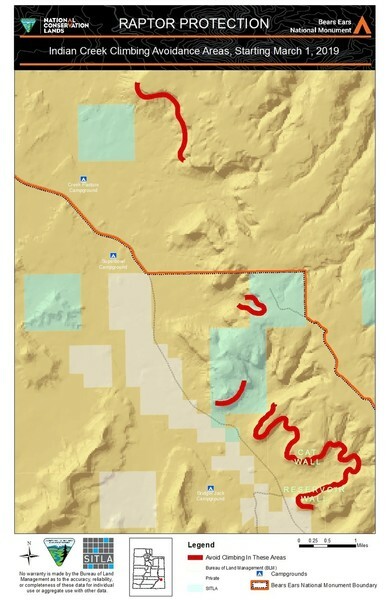 The BLM and SITLA will survey walls and generally in May can release any routes that don't have active nests. The walls with active nests should be avoided until the young have fledged. Eagles and falcons mate for life and return to the same nest sites year after year to raise their young, your cooperation is vital to their survival. Here is a link to the news release and map of the affected areas (add link here). Signs will also be posted at the main trailheads. Please let me know if you have any questions- Thanks!